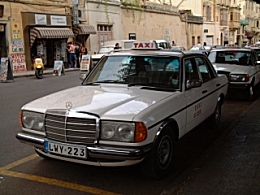 Unlike America’s yellow cab’s and Britain’s black taxi’s you will find Malta’s taxi’s are white and kept in pristine order, in fact this will be determined the moment you walk out of the arrivals terminal. The white taxi service picks people up from any location on the islands except bus stops; there are 250 individually owned taxis in Malta and Gozo with taxi owners assisted in the purchase of new vehicles through lower initial registration fees. Taxi services from Malta International Airport to all localities in Malta are based on a fixed tariff.